At the start of this month some members from CADSAC diving club went to Egypt on the clubs annual scuba diving holiday. This year our numbers available was lower than previous years so could not charter a boat to ourselves so booked spaces on Blue 0 two’s flagship Blue Horizon. Whose itinerary was to the Best of the Brothers. Surprisingly out of 26 divers on board we were the only 6 divers from BSAC and the others all PADI qualified, who were all a great bunch of people, despite the stories you hear when you first join the clubs about alternative training institutions :P. Seriously a great week was had by all. 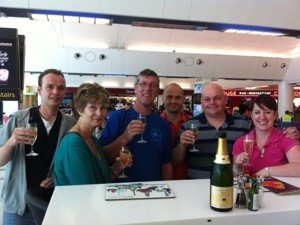 The holiday started with us having a Champagne breakfast at the the Champagne and Caviar bar in the airport. Then after the flight we all clambered on board a coach ready to be taken to the marina to board the boat, as other people boarded certain members of our group remembered that they had not picked up their clothes bag from the conveyor belt in the airport. After sorting out with the Blue 0 two rep and the airport security all bags and people were present ready to join the boat. 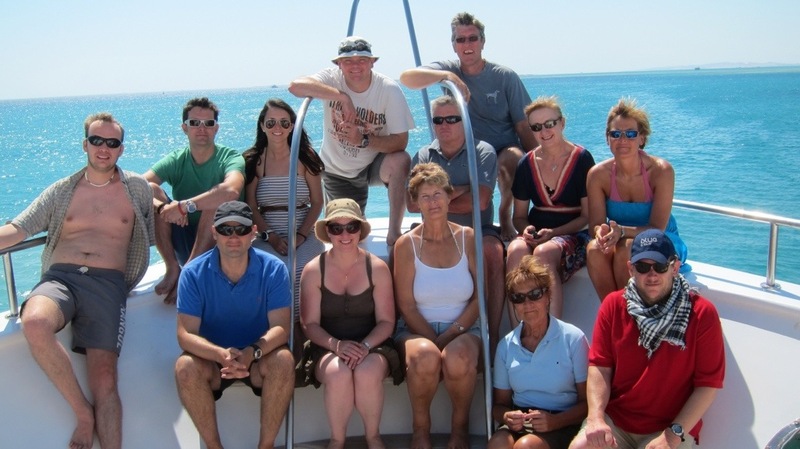 The following morning we left Hurghada marina to our first dive site, Abu Gota Ramada, also known as the Aquarium. It is a small reef, about 100 by 100 metres with a large submerged mount. The maximum depth in 20 metres before it drops down to 50 metres+. The reef lies in the middle of the strait and brings in significant amount of zoo plankton allowing the reef to flourish. The area is covered in picturesque soft coral and an abundance of fish. Which was ideal for our first dives to sort out our dive weights and diving kit, testing our DSMB’s etc. The reef, due to its shallow depth, is well covered in sun light, allowing for some fantastic photography, especially in the smaller little crevasses found around the various pinnacles. We ended spending the day here having three dives including a night dive, where we got great photos, (in my opinion anyway) of Spanish Dancers. Overnight we travelled to the Brothers, first docking at Big Brother. Big Brother, the larger of the two, lies about 1km (0.6 miles) north of its sibling. It is an oblong landmass some 400m (1312ft) long, easily identified by its Victorian stone lighthouse, a legacy of British rule. A narrow reef table round the island’s shore gives way almost immediately to a sheer vertical wall, dropping well past the limits of sport diving. With two wrecks lying at the north corner, the Aida and the Numidia. The Aida is a former 75m long Italian ship that sunk in 1957 while transporting troops. 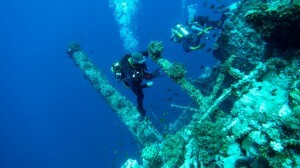 The ship is still in good shape and attracts lots of marine life with schools of fishes all around the wreck. 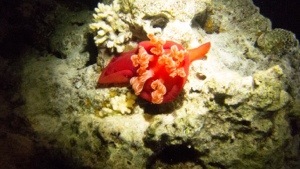 The soft coral is wonderful and makes great underwater picture opportunities. The shallow part of the Aida lies around 17m and it goes down to 60m deep. The Numidia is a former 130m long British Cargo that sunk on its way to India in 1901. Sadly, it was only its second trip! The Numidia was carrying locomotives wheels that can still be found. The Numidia wrecks now lies almost vertically on the steep reef slope with the top being at 8m and the stern being very deep at around 80m deep. 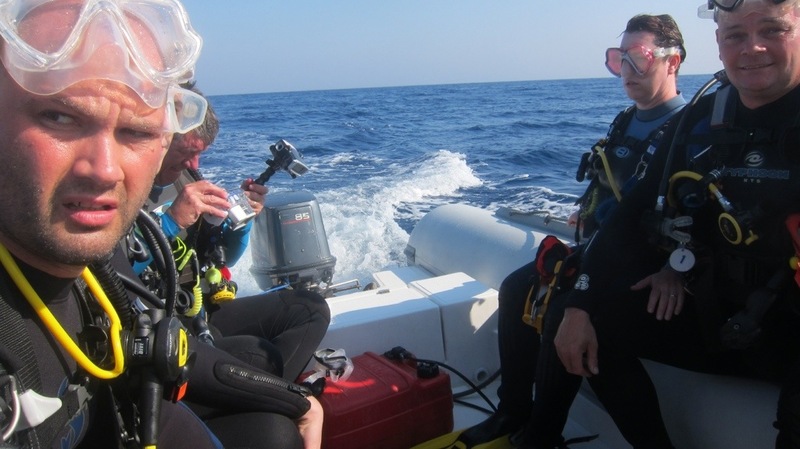 We spent many dives being dropped off by the zodiacs and dropping down onto these two wrecks. The currents were very unpredictable and at times quite scary as they could push you down and out away from the reef. At the cleaning station we saw our first sighting of a Shark, a thresher shark, unfortunately with several boat loads of divers homing into a view of the shark it was short an sweet sighting, with it disappearing into the blue after spotting us. Later in that dive a small female turtle came to tease us before disappearing. Over to Little Brother, Little Brother island sits just below Big and is home to pristine reef, adorned with giant gorgonian sea fans. Shifting currents move down the Red Sea and carry vast amounts of nutrients to the islands and with it an astonishing marine life. The vertical walls are packed with large grouper, scorpion fish, resident napoleon and octopus. Swathes of anthias, snapper, barracuda and tuna school in the blue and patrolling grey reef sharks can be found wherever the currents meet. 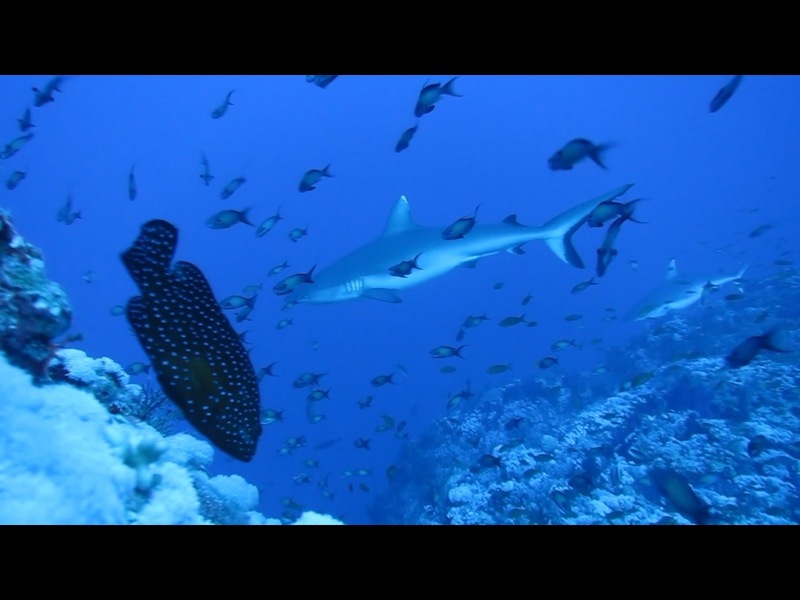 Here is where we we lucky to see two reef sharks at the cleaning station, the current was quite strong, which tried to carry us around the reef but we lowered down the wall we we able to sit and watch these fascinating creatures. After several more unsuccessful dives trying to be dropped onto the cleaning station, the current was too strong for us to see the sharks again, although other groups got see a group of four sharks, but we dropped too far over to fight the current back. On our way back to Hurghada we stopped at Safaga, thinking that we were going to dive the unfortunate Salem Express, we were hindered by the powers of democracy and it was put to a vote of either another reef or the wreck, which the reef won, with the false hopes of seeing Hammerhead sharks. The guides were not fans of wrecks and knew how to influence the majority. We dived a reef named Abu kifan, it was a pleasant reef but no sightings of anything big and the colours not as bright as Yolanda reef from last year it was not anything special. Then onto Panoramic reef for two more dives. A short night dive at some pinnacles at Tibia Abba was a great dive until the Lion fish would not leave us alone, every time we turned around we had another LionFish join us with others coming quickly through the darkness at us, we aborted after 20 minutes. Our final days diving was my kind of diving, a nice reef named Small Giftun. this dive was a relaxing exploration along a magnificent wall, where you can ‘fly over’ extensive stretches of large fan corals. The dive leads to a sandy plateau dotted with numerous coral formations. Here it is common to see turtles, moray eels, crocodilefish and spotted stingrays, as well as schooling fusiliers and goatfish. And then followed by our final dive, a wreck dive of the El Minya, an Egyptian minesweeper sunk by Israeli fighters while lying at anchor in 1969, this wreck lies in 30m on a rock sea bed. There is a large debris field which contains a lot of ‘LIVE” munitions. The wreck is only 70m long so there is plenty of time to explore everything including the blast hole on the starboard side, which can be penetrated. There is not much in the way of coral growth on the wreck but it does have its resident fish life. The blast hole gives shelter to shoals of glassfish and a lone anemone and resident clownfish are also in this area. 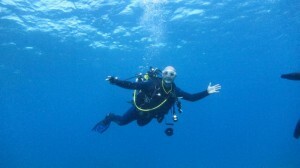 Then back to Hurgahada for a relaxing day by the pool, degassing from a week full off great diving. 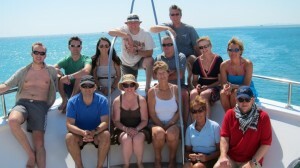 thanks Mungo for organising yet another great dive trip. Check out the photo gallery for a selection of our photos.